Our database driven web modules are designed to complement the chamber’s existing website and improve SEO (Search Engine Optimization). At GrowthZone, we enjoy collaborating with local web designers to incorporate ChamberMaster into existing sites. We provide a seamless solution that allows your site design and functionality to be enhanced by content and interactive features driven from the chamber’s database. Responsibility for site updates remains with the chamber. Create a sub-domain that points to our server. 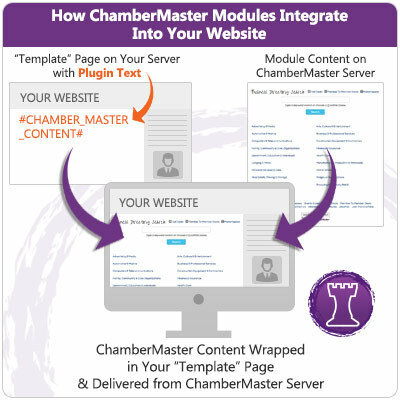 Create a template page within your website; add our tag on the page where the ChamberMaster content should appear. Your template should include your site’s global style sheets for consistency. Use the ChamberMaster Integration Control Panel to personalize your options. At a minimum, you will need to enter the URL path for your template file and add your base tag URL to properly apply style sheet definitions. You may wish to customize additional styles and/or add your own rules. Add new or update existing site navigation links to refer to the new pages. For instance, replace your current Business Directory link with the new page link. We recommend also updating your .htaccess file to refer to the new page links. If we are completing the website integration step for you, we will redirect the main page links for each module provided in your edition and integrated into your site. This does not include the sub pages within a module (such as a specific event page or member page). Those can be added by your webmaster or per custom bid. If you are like many of our customers, you may already use a CMS (Content Management System) such as WordPress or Joomla. Additional tips for specific Content Management Systems are available. Our website integration team can also complete the integration process for you or provide technical advice to help you incorporate these modules into the chamber’s website. Either way, our team is here to ensure a smooth transition.